One of the best things about paddle boarding compared to other watersports is that you can do it all year-round, no matter the season. That’s not because you bought plane tickets to paddle elsewhere, but because with the proper attire you can head out in all four seasons regardless of your location. All you need to do is bring suitable clothing for the current conditions, which we’ll cover below. Cold weather paddle boarder enjoying the changing leaves and snowcapped mountains in Oberhofen, Switzerland. One thing to keep in mind regardless of the specific season is your option to layer. If you have a dry bag or something you can store your layers in and bring along with you then you have options. Remember the time of day you start and finish can make a major difference in what’s comfortable to wear. For instance, in summer you might find the mornings and evening significantly different from your daytime comfort level. So keep in mind the time of day you’ll be starting and finishing and remember you can always layer. Comfortably enjoying the sunrise at Spring Lake, USA. It’s easy to feel called to the water at this time of year. The sun is shining. The air is warm. Falling in isn’t even an issue. In fact, you might choose to jump in yourself. 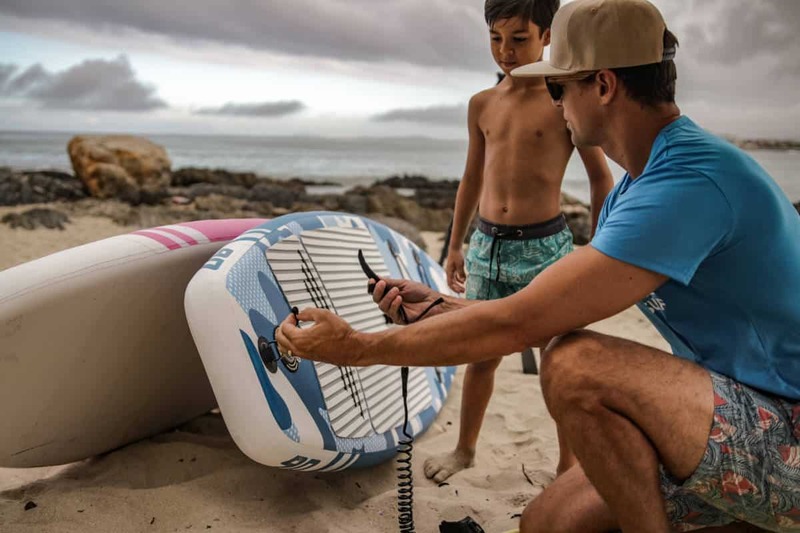 Since paddle boarding in the summer months most likely means an occasional dip in the water alongside your board you’ll need the typical watersport attire. A thin breathable top is ideal because it can offer you some protection from the sun rays while allowing you to remain cool. Of course a bathing suit of your choosing, so you can dive in and enjoy the water. And, since you have the room for them on board even if you choose to swim you might want to consider bringing along a hat and sunglasses. Not just for style, but for some protection from the sun. It’s easy to spend a full-day out in the sun when you’re doing something you enjoy like paddle boarding, so regardless of what you do choose to wear don’t forget your sunscreen. If you’re dressed appropriately you can paddle all year-round. Although it may be tempting to simply bundle up under your normal cold weather layers it’s a risky decision when paddle boarding. Whether you’re a pro or a beginner you are always at risk of falling in. It can be uncomfortable to get wet when it’s warm out, but it can be dangerous when it’s cold. Falling into cold water in thick clothing will not only make it difficult to swim, but also make things worse when you finally get back on your board. Sure you’re out of the water, but now you’re soaking wet and exposed to the wind on open water. That’s why we recommend finding yourself a wetsuit. They are an absolute must in any weather below 50 degrees. Dressed for the weather all the way up in Wells, Maine. Wetsuits provide warmth through thermal insulation. The insulation of the wetsuit is proportional to its thickness. So the colder the weather, the thicker you want the wetsuit. They range in thickness from 1mm – 6mm, so winter appropriate starts at 4mm. Wetsuits are worn in a diverse range of watersports they come in a variety of shapes and sizes. However, since we’re mainly concerned with their use for warmth it’s best to select a full suit rather than one of the other options. At these temperature you’ll also want to pick up a pair of boots and gloves. Similar to the suits wetsuit boots vary in thickness (from 1mm – 7mm). Whereas the gloves thickness ranges from 1mm – 6mm. Same rule of thumb applies, the colder the weather the thicker you want the material. Sunset paddle at Bellingham, USA. For some of you more hardy stand up paddle boarders this may seem like overkill, but wearing (or at least packing) the proper attire will allow you to stay out on the water for much longer and more comfortably. Warm or cold, rain or shine a bit of preparation can lead to a much more enjoyable day.